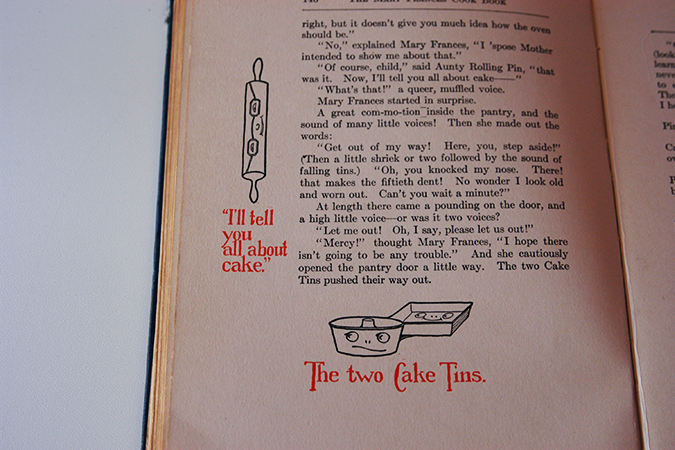 I first heard of Mary Frances books when my friend Crystal gave me one of their reproduction copies. I believe it was The Mary Frances Sewing Book . She said she was finished with it and wanted to pass it on to someone else who would enjoy it. I was immediately charmed by the illustrations inside and set to work finding out more information. I quickly found out there are many Mary Frances books, seven total, and the old editions sell for a lot of money. Jane Eayre Fryer a school teacher wrote and illustrated the books starting in 1912. 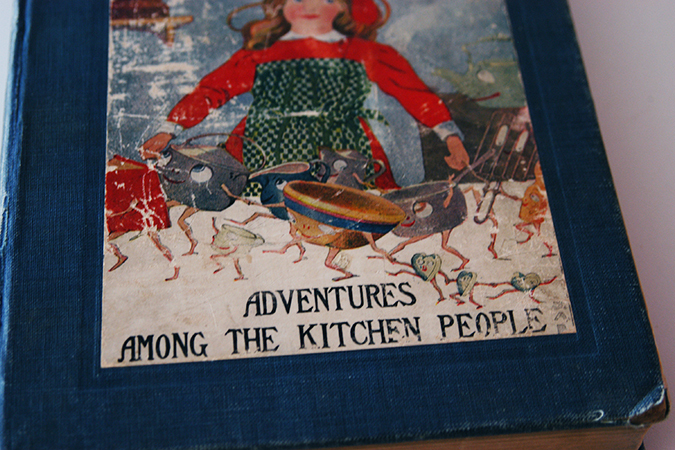 The books are not only charming little stories, but contain lessons, how-to’s and recipes. Of course being the book nerd I am, I passed along the reproduction to another friend and set to work finding some of the older editions for myself. I have had the best luck finding copies around $20 each by keeping an eye on Ebay, Amazon’s used books, and Alibris. A lot of time the listings on Alibris will not have photos so you have to read the description carefully to make sure you are indeed getting an original and not reproduction copy. 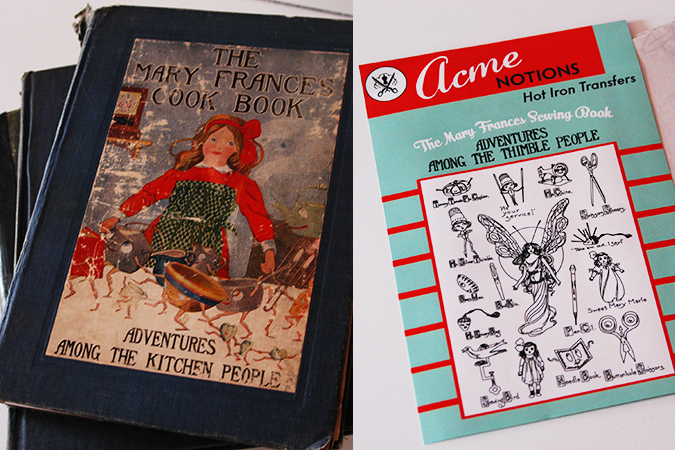 So far I have been able to collect The Mary Frances Cookbook, The Mary Frances Garden Book, and The Mary Frances Sewing Book. Now I am just keeping my eyes peeled for a bargain on the others. So back to my original friend who introduced me to the books, she recently had a birthday and while looking for something unrelated I stumbled across these Mary France embroidery patterns by Acme Notions. I knew I had to get a set for Crystal to go with her gifts, and of course I needed a set of my own. 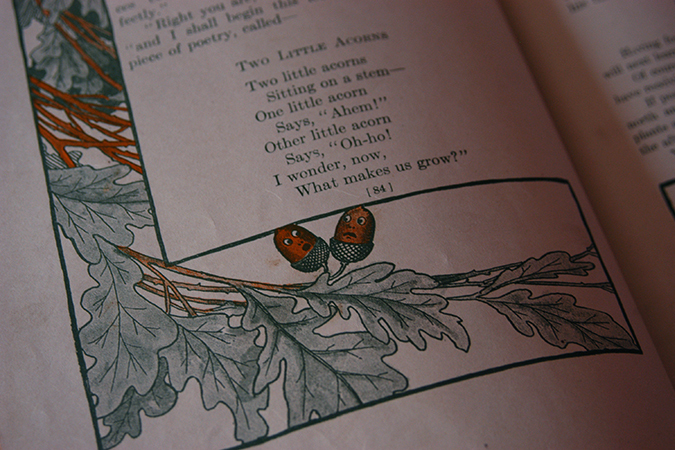 I wish they had patterns for each of the books, the garden book has such cute illustrations inside. if you’d like to learn even more about Jane Eayre Fryer, this website has a blog and information about all of the books. Today I just wanted to share a few movies with you. A couple I have seen, or just can’t wait to see. 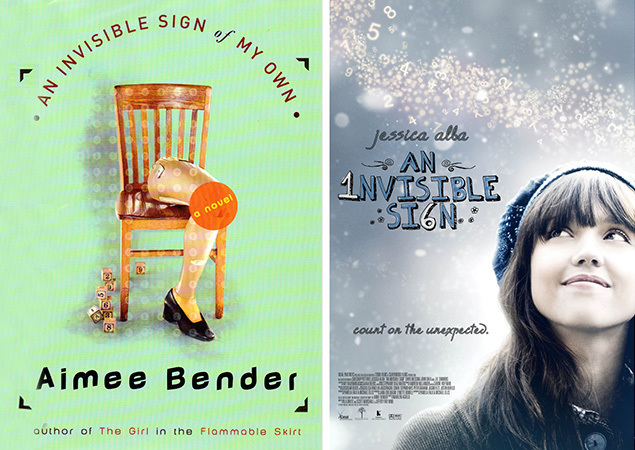 First up a movie based on one of my most favorite books, Invisible Sign. I found this one accidentally when browsing Netflix for something to watch on instant. It actually came out back in 2009, and I was wary of Jessica Alba playing Mona. I had just seen her as the main character in Spy Kids 4, and I think she’s had too many roles where she plays something completely opposite of Mona to make this work. That being said, I still actually really enjoyed the movie. I’m glad that Mr. Jones and his wax numbers did not disappoint me, and I thought Lisa and Ann were spot on. It felt a little rushed like most books to film, but overall I liked it. 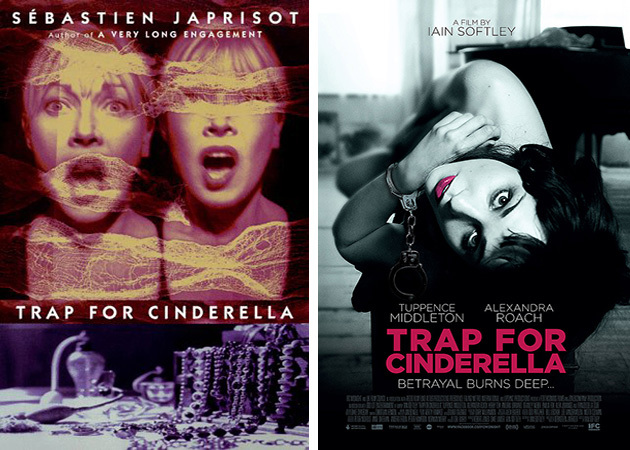 The next film is Trap For Cinderella, which I have not yet seen (was in theaters in Dec, but not around here) The first book of Sébastien Japrisot that I read was A Very Long Engagement (highly recommend the book & film both so very good) Of course after reading that I became a bit obsessed seeing what else I could find of his work that had been translated. I’ve only been able to find and read 6 of his books, but I loved them all. I’m not usually one to go for murder mystery novels, but something about the way Sébastien Japrisot could craft a story really hooked me, and kept me guessing. The film has a lot of bad reviews, but I’ll still give it a try with an open mind. I saw Finding Vivian Maier on Mother’s Day, and really enjoyed it. When I first saw the trailer it reminded me a little of Henry Darger and the documentary In The Realms Of The Unreal (watch it, its amazing!) Henry was an amazing artist and novelist in secret, spending his time working as a janitor and then spending his free time working on his own creative world. Thats very much simplifying everything so I encourage you to check out the documentary, which is really one of the most beautifully put together documentaries I have ever seen. Ok back to Vivian Maier, she was an unknown street photographer who spent her time working as a Nanny. Her photographs and undeveloped film were discovered by John Maloof, a man in Chicago who was writing a book on the history of the city. He had been going to flea markets looking for old photos for his book…and went on to direct Finding Vivian Maier. Its a really interesting story. I was just left wanting to see more, hear more of her recordings, but I realize there would of not been a way to put all that in there. It’s very much a documentary about her as well as the John Maloof and the events that went on after he found the photos. 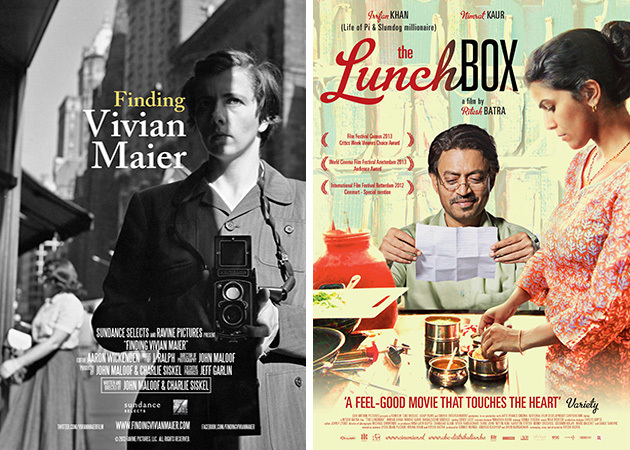 The last film The Lunch Box is something I keep seeing previews for on other films, and it looks so sweet and charming. If I don’t get a chance to go back to The Majestic Theater in Gettysburg and see it while it’s there, I’ll keep an eye out on Netflix for it. Besides all these gems we also saw (and loved, but its no surprise) Wes Anderson’s Grand Budapest Hotel. I cannot wait for it to release to dvd so I can watch it again. I think we would need to whip up some Mendl’s Courtesan au Chocolat for the occasion! I have only been yardsale shopping 4 or 5 times this Summer, but have found some great stuff. These gems were from a church yardsale a local friend had texted me about the day before. 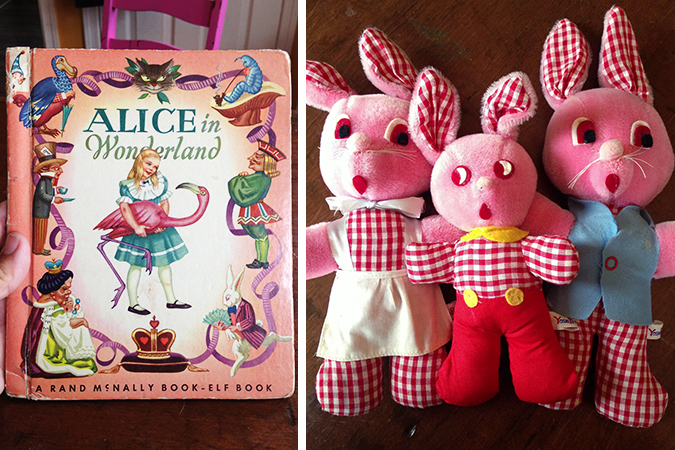 A new version of Alice In Wonderland for our collection, and this family of bunnies was split up and all mixed up in a huge pile of plush. Once I found one I thought I should dig a bit more. I’m happy I did because it meant all three came home to live with me.